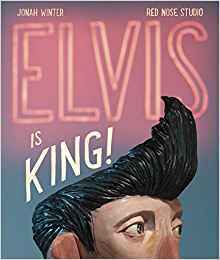 Jonah Winter is the author of the new picture book biography Elvis Is King!. 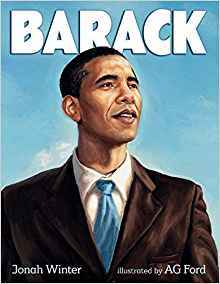 His many other books include Ruth Bader Ginsburg and Barack. Q: Why did you decide to write this kids' picture book about Elvis? A: My initial reason for wanting to write a book on Elvis was a rather obvious one – I love Elvis! Always have, ever since I was a kid. And I think his music is something that even very young children could get into. Why just this past Thanksgiving one of my nephews was belting out “You Ain’t Nothin’ But a Hound Dog” with the karaoke machine set up in my in-laws’ basement during that part of the evening when, after eating and drinking every available thing in the house, we turn to entertaining ourselves. Minus the karaoke machine, I used to do the same thing when I was a kid – still do. But my other reason for wanting to write this was more complex: I had originally wanted to present Elvis’s story as a “saint’s tale” – stations of the cross of Elvis – and had tapped into the blatantly religious cult that has elevated him since his death to that of Holy Figure. My editor, though, was opposed to this explicitly religious approach – even after I explained that my tongue had been firmly planted in my cheek. As far as she was concerned, that just made it worse. Now I was making FUN of religious fanatics! So, ix-nay on that approach. And in the end, I am very happy to have abandoned that approach for the one that I ultimately used – one that celebrates Elvis’s humanity. There is still some humor, and still some religion, I think, but in general it’s pretty durn sincere. And I would say it’s straightforward as well, except that’s not entirely true. The structural approach I stumbled upon when initially concocting this story (as a “stations of the cross”) was really exciting for me – because it was so different from anything I’d ever tried before, a different way of telling a story: through little windows, little poems. That seemed perfectly in line with the goal I ultimately had – which was to humanize this “ICONIC” figure, bring him into a small, up-close, humble perspective, so that readers could see him as human. Q: What was your research process like this time around? A: My research for this book was similar to the research I do for most of my nonfiction books – I read a bunch of books on the topic! I did that – while trying to channel, as best I could, the spirit of the Reverend Howard Finster, that amazing, eccentric folk artist whose many depictions of Elvis reveal a reverent adoration, like unto that of the three Magi as they beheld, at the manger…. Oh, wait. Sorry. Must’ve blacked out there for a minute. Q: The illustrations are by Red Nose Studio (Chris Sickels)--what do you think they add to the book? A: Those amazing illustrations MAKE the book! I couldn’t have asked for a more perfect illustrator for this particular story. And I have to credit the editor, Anne Schwartz, for having the brilliance to consider him, to envision what he would add to his book – which was, essentially, humanity and humility. From Elvis’s humble upbringing… to his shyness… to his plunge into instant stardom…,the humanity really shines through in Chris’s illustrations. What he does in his art is just so incredibly personal. Like Elvis said when the woman at Sun Studio asked him who he sounded like – “I don’t sound like nobody” – Chris Sickels’ art don’t look like nobody’s. For me, the most important quality of an artwork is that it be personal, original. I mean, it should be a given that, if it’s art, it is visually appealing. But past that, it should take you into a different universe. That’s what Chris’s art does. I am so thankful to have been paired up with him on two of my books. It is a blessing. Q: What do you hope kids learn about Elvis and his music from this book? A: For starters, I hope that children will see, through Elvis, what enormous talent and spirit can come out of the most humble shack – in the most sneered-at, hated, marginalized neck of the woods. We in the culture sphere, myself included, spend a lot of time talking about prejudice, about marginalization, about injustice. But it is very rare that you hear much discourse, in the elite and elitist blogs and reviews and literary conference panels, about poor southern white people. If anything, you hear them blamed for America’s problems – you hear contempt for them, derision of them. Their lives are filled with misery – and that misery gets compounded by their being regarded as “trash,” not even human. Are they any more racist than white-upper-middle-class suburbanites who don’t want black people living in their neighborhoods? I don’t think so! To characterize them as all being members of the Ku Klux Klan is not fair or accurate. And yet, that is the perception among the coastal elites. In this age, in which the culture sphere is controlled by those whose contempt for southern white culture is not even concealed, I view it as an accomplishment to introduce kids to a side of American cultural history that they would not otherwise learn about. I see it as a counterpoint to the prevailing narrative that Elvis was a racist cultural appropriator. I want kids – all kids – to see what is possible with basically no money, just a banged-up old thrift-store guitar bought with pennies mama had saved. I want them to see the power of music to lift our lives and spirits. I want them to connect with the universal healing powers of music. A: Ah, this and that. In the age of #ownvoices, I am now being told that I do not have the right to write about people who do not share my cultural background and gender (southern white male). But the problem is (see previous answer) that no one wants to publish books on people like me! 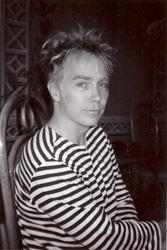 And truthfully, my desire is to write books about a full range of people, not just people who, by luck of the genetic draw, happen to be endowed with characteristics I share with them (such as whiteness and maleness) that are beyond one’s control and really have nothing to do with literature or why and how it gets made. So, I don’t know what’s next. Maybe a book on puppies? Or cats! Books on cats sell, right? Of course, I’m not a cat, so maybe I have no moral right to write about this species…. A: My next book after Elvis, coming out in May 2019, is entitled The Sad Little Fact. Unlike most of my books, it is, ironically (given the title), a work of fiction – about a sad little fact that nobody believes. 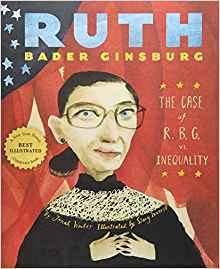 In an age when objective reality is under assault on a daily basis, I’m sad to say that kids are in dire need of this book. The illustrator is Pete Oswald (of The Bad Seed fame), and he has done a spectacular job with the illustrations. On the illustrator front, at least, I am one lucky guy. --Interview with Deborah Kalb. Here's a previous Q&A with Jonah Winter.